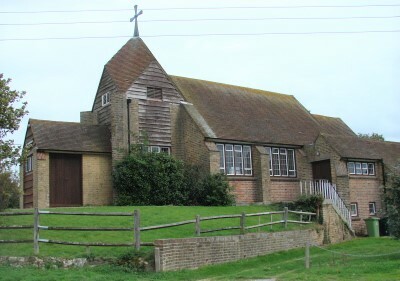 The area on which a modest seaside resort was developed in the early C20 was actually still in the parish of Pett when in 1935 a former garage was adapted as the first church. This was replaced by a permanent one in 1961-62, by J D Wylson (ESRO Par 543). Faced with brick outside and with big side-windows, it has a squat tower at its eastern end, the sides of which are covered in rustic timbering, with a Rhenish helm spire. Inside, though there are a nave and a narrower chancel, there is no arch between them and both have trussed roofs and plastered and painted walls. The enclosed porch beneath the tower may be a later addition as it is in a different brick. 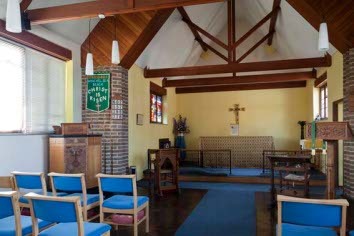 Since 1967 the church has been in the parish of Winchelsea. Glass: (Chancel, north window) A Younger, 1965 (BE(E) p676). My thanks to Nick Wiseman for the photographs of the interior and the stained glass.